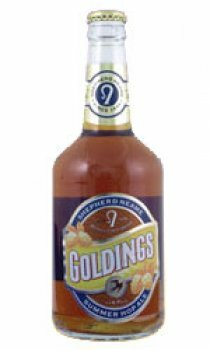 Goldings Summer Hop Ale is a light-flavoured bitter made with Kentish malt and fresh Goldings hops. Harvested from hop gardens within five miles of the Shepherd Neame brewery in Faversham, the beer is almost floral-scented, with a unique biscuity taste. Just the sort of pint to enjoy watching village cricket! Light malty flavours and smoothness provide a refreshing Summer ale with notes of new-mown grass. The resinous aroma of the hops and fruitiness from the yeast complete the country character.